Climate Change in the Northwest: Implications for Our Landscapes, Waters, and Communities is aimed at assessing the state of knowledge about key climate impacts and consequences to various sectors and communities in the northwest United States. It draws on a wealth of peer-reviewed literature, earlier state-level assessment reports conducted for Washington (2009) and Oregon (2010), as well as a risk-framing workshop. 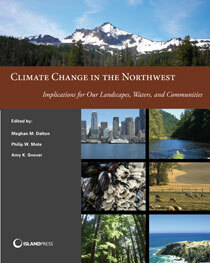 As an assessment, it aims to be representative (though not exhaustive) of the key climate change issues as reflected in the growing body of Northwest climate change science, impacts, and adaptation literature now available. This report will serve as an updated resource for scientists, stakeholders, decision makers, students, and community members interested in understanding and preparing for climate change impacts on Oregon, Washington, and Idaho. This more detailed, foundational report is intended to support the key findings presented in the Northwest chapter of the Third National Climate Assessment. "[Climate Change in the Northwest] is a lucid, engaging precis of climate change science and impacts in the Pacific Northwest."